The owners of a New Forest watermill first recorded in the Domesday Book have cut their energy bills in half by undertaking a range of energy saving improvements. Efford Mill, near Lymington, has been fitted with a variety of green features to slash the costs of running the medieval and Georgian property, from high-tech power systems to common sense measures such as insulation. Back row (left to right): Simon Rogers, Fiona Rogers, Jeremy Rogers. 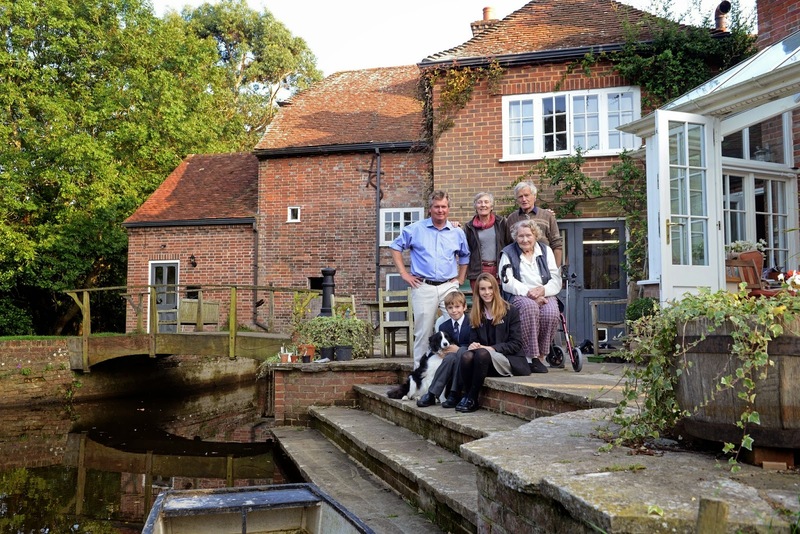 The mill, owned by Fiona and Jeremy Rogers, is throwing open its doors to the public over the weekend of 4 and 5 October as part of Green Open Doors, an open house event run by the New Forest National Park Authority to inspire people to save energy around the home. Fiona and Jeremy moved into Efford Mill in 1964 and spent years painstakingly restoring the mill to house four generations of their family, from 10 year old Tom Rogers to his 94 year old great granny Patricia Barrie. By 2006 the property was largely restored, but its energy costs had soared to over £5,000 a year. In an effort to reduce their bills and live more sustainably, the family set about transforming their home with environmentally friendly measures. These include solar panels controlled from a former World War Two bunker and a ground source heat pump buried in the bed of the river that snakes through their back garden. Energy saving at Efford Mill is not restricted to high-tech energy systems; the family have also installed more common features including double glazing, water butts and wood burning stoves. The public can see the mill’s eco-features and ask the owners about the pros and cons of sustainable living throughout the Green Open Doors weekend. This includes discussing the relatively high set up costs of eco-technology for the home, with solar panels costing the Rogers family £8,000 and their ground source heat pump setting them back £16,000. Fiona said: ‘Our set up costs were quite high for our main energy saving features, but we are taking a long term view. The solar panels will pay for themselves in eight years and the heat pump in 15 years, plus the panels now earn us a feed in tariff payment of around £800 a year. ‘We are quite happy about that, because we are aiming for the lowest carbon footprint possible, and we are certainly not paying anything like the gas and oil bills that we would have had. We feel strongly that sustainability is the only logical way forward. Green Open Doors is a free event, organised by the New Forest National Park Authority and New Forest Transition, which sees 11 properties opening their doors throughout the weekend of 4 and 5 October. Find out about the participating properties, and which energy saving features their owners can advise on, at www.newforestnpa.gov.uk/greenopendoors.